Patrick Rishe writes at Forbes.com that he believes the Cards’ deep run into the playoffs and World Series appearance further cements the chances that Albert Pujols will re-sign with St. Louis. At the Mariners blog Lookout Landing, Jeff Sullivan recounts the Cards’ improbable comeback to win the NL Wild Card and addresses the age-old “pitching wins championships” adage. St. Louis’ very own Bernie Miklasz of the St. Louis Post-Dispatch recapped the Cardinals walking the walk, while letting the Brewers do all of the talking. A Cubs blogger thinks that Carlos Marmol should receive a playoff share from the Cards. 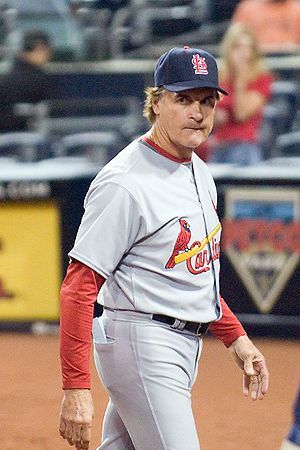 Jason Keidel at CBSNewYork.com pens a nice complimentary piece on Tony La Russa, but not before going out of his way to more or less discount the Cardinals as a lucky, out-of-their-element also-ran. Name four starters other than Pujols, Jason? Lance Berkman, you know, used to be a Yankee? Chris Carpenter, the guy who dominated Philly? Matt Holliday? And what about this guy who just won the NLCS MVP – David Freese? Wishing that there was a Championship Series MVP in New York this season, Jason? ESPN.com’s SweetSpot blog-meister David Schoenfield put together summaries of how each roster was assembled – both Cardinals and Rangers. Steve Henson of Yahoo! Sports measures the two clubs up against each other and thinks that the Rangers have an advantage, comparing position-by-position. Maybe you’ve already seen the treasure trove of Cardinal related songs at InsideSTL.com and already know that the Cardinals are coming (tra-la, tra-la). But what is also coming are new songs, one after the other, and these dudes are getting serious. We’ve got steady increases in production value and the lyrics keep getting tighter. So now I put it to you, loyal readers – which song are you buying?